Ok, so many kind, sweet people have offered to help with the I Love Lucy fundraiser. And before I even go any further let's make sure it is clear that this fund raiser is to help ALL BBS kids, not just Lucy. We realize the title "I Love Lucy" has good reason to cause some confusion on that! It just happened to be a catchy name and something we had going a long time before this new reason to raise funds came up. What we are doing right now potentially benefits all kids affected with BBS, which in turn benefits their families as well. For more information on HOW all this benefits these kids, read HERE and HERE for all the details. Thanks in from the bottom of our hearts for all everyone has already done so far! My family, living further away and not able to be here for things like that, have offered some kind of unique ways to help. My sister Charity is heading up the project to make Lucy's art into greeting cards which will hopefully be available soon. I'll let you know when that happens. My sister Saydi has offered to donate proceeds from a photo shoot to the I Love Lucy project which is very generous because she is a whiz-bang-awesome photographer (see some of her stuff HERE). 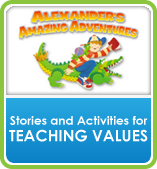 My sister Saren, who runs Power of Moms has offered to donate a big chunk of the proceeds from the sale of Alexander's Amazing Adventures during the month of December. I have to say a little extra about Alexander's Amazing Adventures because every single family with kids needs these. For reals. They are that good. Some ultra talented and entertaining people put these together years ago. They teach kids about values in an amazingly entertaining way, and now Power of Moms has come up with some good parent tools to help families get even more out of them. I need to remember to have my kids listen to these again because they LOVE them and we haven't listened to them in a while. It's a perfect listen on a car trip, before bedtime, down time after school, etc. I believe we live in a world that is losing the art of these values in some ways. Don't get me wrong and get all huffy when I say that, there are still so many good people in the world and good things going on, but sometimes I think we lose track of the bedrock values. So that's why I adore these things. And because they make me laugh. They are pretty entertaining I tell you. Right now they are doing a special for us. They are on sale for only $48 (that's a good chunk off of the regular $70 they cost). Click HERE to see what comes with that price. Even though I already have these things I want to buy them again just looking at all the new stuff Power of Moms has come up with to go along with the adventure stories. These things are good, people. Trust me. Buy them for your kids for Christmas, and benefit BBS at the same time! Out in the blog-world-cyberspace others have also come together to fight BBS. The dad in one blog-reading family living in England offered to do an episode on BBS in his weekly science education podcast with Macmillan books (see what that is here: http://www.quickanddirtytips.com/everyday-einstein It looks really cool...something I need to look into with my kids) as well as promoting the fundraiser through the social media channels during the month of December. I think the episode about BBS will go live on the 14th. This guy also happens to be releasing a new middle-grade science fiction e-book today which is HERE. He will donate half of the proceeds from that book to the I Love Lucy project during the month of December. · Wednesday December 4th-Friday December 6th: 20% of all sales fromThreads Worldwide will go to the I Love Lucy Project! Threads mission provides sustainable income opportunities for women worldwide through the creation and sale of fair trade jewelry & accessories. Use code: "LUCY" in the "referred by-other" box when checking out. There's some really cool stuff over there and I love things that are a double whammy: helps women worldwide as well as getting some great Christmas gifts. Another reader sent in this link for a cute niche of "missionary aprons." Kind of a fun Christmas gift idea for those missionaries out there! http://www.missionaryaprons.com/ They are willing to donate 15% of their proceeds to the I Love Lucy project from December 2nd through December 6th (Monday through Friday). Go check them out. Another blog reader who happens to be an exceptional teacher in British Columbia has taken it upon herself to help her 8th graders (who are considered "inner city" kids) connect with Lucy. This is what she wrote: "My goal is to have Lucy feeling empowered by educating grade 8 students about her exceptionalities, and to have my grade 8 students feeling connected to the world, educated about optical related issues and modern medicine/technology and humbled by the powerful story of a little girl." So incredibly sweet. They will do their own sort of fund raiser in the spring. So many kind good people reaching out. We appreciate you so much! Oh boy I love Amazon. So, there you go. Perfect ideas for getting that Christmas shopping done all wrapped up with a perfect way to help BBS kids. Thanks so much for all the kind offers to help!! i found another great gift on Etsy $5.00 for a 2014 LDS Planner with over 280 pages including F.H.E, Family Traditions, Holiday Planning and more! Maria. Then don't. There are lots of things that can use your 10 percent. You can say no. It's really not about whether they live in a 3 bd apartment or not. We have no idea how much they contribute to the cause that effects their family. And it's none of our business if you do or not. For some reason people like to promote a cause that wants funding. You may for example help at the school book fair since a portion goes to the school. Encouraging people to buy a book that may help the school. That doesn't mean every resource you have will be diverted to the school. You will still save for retirement, give to your church, buy your grandchildren nontechnical Christmas presents. 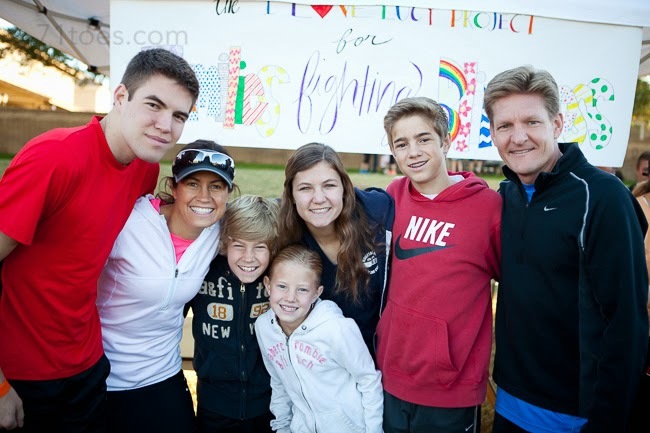 One child with a medical challenge doesn't mean all the siblings or even that that child can't play soccer. Life must still be lived. The sad thing is the family could live out of a trailer and Lucy and others may still lose their sight. There are some challenges money just can't fix. It's really not an either or situation. Parenting a child with challenges is hard. It is a wonderful blessing and helpful diversion to worry about the ceiling for a few weeks. It helps keep the mind sane actually to be able to focus time on other more ordinary things. Renting costs far more than owning. But the way. Agree with Kms above. I am asked many, many times for donations throughout the year. I don't buy the idea that people raising money for bbs, or ms, or cancer, or autism need to be living modestly "enough" to warrant me giving to the cause. Shawni is raising funds to support all bbs research. She and Dave, while they live comfortably, cannot be expected to singlehandedly fund all bbs research in the United States. I can donate and am happy to donate, but if that's not you that's okay. Just don't espouse unrealistic expectations about how people must live before they're permitted to fundraise. Wow! Maria again unbelievable! I don't know why you read this blog when you find so much to criticize. I have a great idea for raising money for the "I Love Lucy" project this weekend at the Color in Motion 5k race in Gilbert, AZ this weekend - we'd love to donate from the race to help Lucy! Send me an email at whitneyjvincent@gmail.com. I have been searching on where to contact you guys and have had troubles finding an email address to reach out to you. Thanks! Great ideas. How exciting to see this rolling along! Just love it. And I Love Lucy too! I do not usually erase mean comments from this blog. I don't understand them at all...I don't know why people feel they need to attack others...but usually they roll off my back and I realize some people are just sad or lonely and just maybe need a way to vent. Sometimes mean comments lead me to think a different way or start a series of interesting thoughts from other commenters. So, I usually just leave them alone. Often times mean commenters come back and erase their own comments because they feel silly they put them there in the first place. This blog is our family journal. A way to document our life. My children read this. They have learned a great deal from mean commenters. I think it's been good for all of us. But when someone leaves a comment like the one left tonight it's almost like our family just got spit on. So I erased it. I have to protect my family to some extent. If you are sad, or lonely, or just having a rough day, I am very sorry. I wish I could help. But please realize we are not a punching bag for people to fling hurtful words at will. Yes, I put out a lot on this blog. I do it because I am a record keeper at heart and because there are so many gracious, kind readers out there. Sure, because I put this information out there people have an open forum to say what they want. But I also have a right to wipe away the mud flinging when it comes and if it cuts deep. Please do not come to this blog if the things I write make you feel you need to say mean things. Thank you to the kind commenters who have my back when sad or lonely commenters come around. I usually like to send back a little love to them because I know that more than anything else, that is what is needed. But tonight, I just need to let you know that even through a computer screen, words can really hurt. It's too bad that some people do not understand that philanthropy is more something that comes from the heart than from the wallet. Thank you for all the support from so many. We so very much appreciate it. Maria, I hope you have a better day tomorrow! As always Shawni, so classy. I didn't read the comment, but I'm so sorry you were the recipient of the mud slinging. You and your family don't deserve that, you do so much good. Thank you for sharing your goodness with us. I ordered $41.01 thru your amazon link but also was unsure if anything got donated as there was no special prompt...just fyi. Love your blog! Thank you for sharing your retort. Cyberbullying is frightening, and I hope I can be as proactive and graceful as you have been. I have never left a comment, but I just wanted to tell you that your blog really inspires me. I am grateful that you share so much of your life...it helps me want to be better and do better. I am sorry for the hurtful comment that was left, I saw it and I honestly can't believe what some people say. Thank you for still being willing to be so open and share all you do! To balance out the mud slinging I just wanted you to know how much your blog has inspired me as we begin to teach our young family. Your traditions, deliberate parenting, faq's, and resources have helped more than you will ever know. I hope your children realize how blessed they are to have such an incredible and caring mother who will go through such lengths to provide for her children. You are such an inspiration!